We attend a lot of whisky events here at TimeforWhisky - a lot of really enjoyable whisky events. Between the events Hendy attends in Australia, and the ones Steph and I attend in Asia, we've probably covered 50+ events this year alone, and all of them have been great. 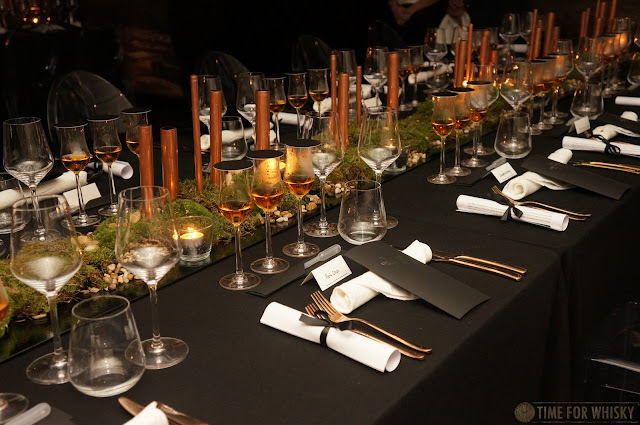 ...but every now and then, an event comes along that sets a new standard, and manages to blow us away (in Sydney, Ardbeg Day sits in that category every year, as did this year's "Great Whisky Rumble"). In Hong Kong, that event for 2015 was clearly Chivas Regal's "The Icon" launch - at "The House of Chivas", held this week. Actually, calling it an "event" doesn't really do it justice. Taking over Hong Kong's newest bar Foxglove, "The House of Chivas" spanned 5 days, 20 events, and saw a mix of media, industry folk, VIPs and others get together to enjoy lunches, dinners, a cocktail competition, social ventures, blending sessions, tastings, parties and of course plenty of Chivas Regal, including the incredibly rare "The Icon" (which we mentioned last month and which Hendy tasted recently at the Australian launch). We attended a lunch (actually two - greedy, we know) and blending and tasting session with none other than Chivas Regal's Master Blender, Colin Scott. 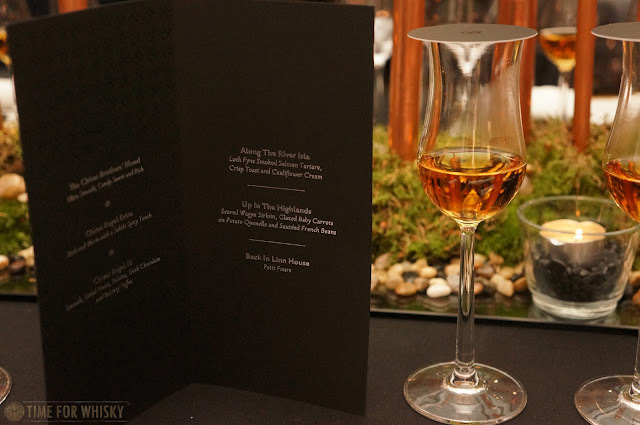 We'll cover the blending session in another post, and focus on the lunch / launch here, which also saw us revisit the fantastic Chivas Regal 25 year old. 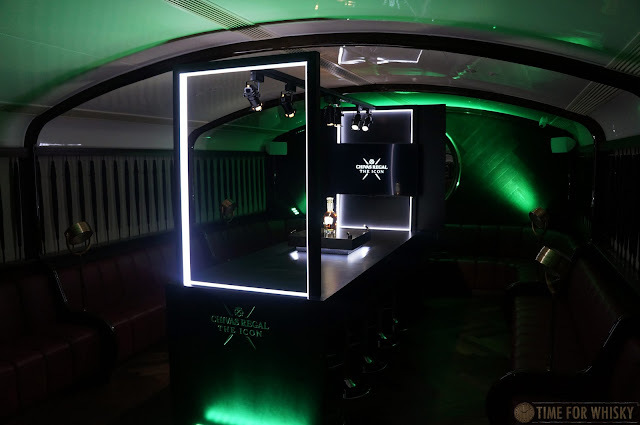 From the moment we stepped into Foxglove, it was clear Stir PR and Pernod Ricard had left no stone unturned turning the entire venue into "The House of Chivas". 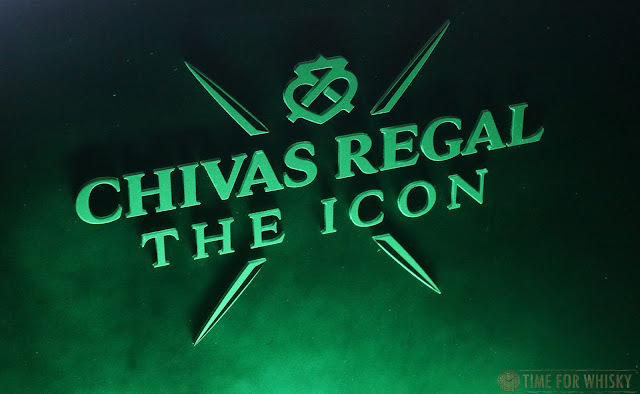 Upon entering, we were first welcomed with a personalised key, and asked to hold onto it until the time came, then ushered into a hallway where our Tuxedo-wearing host explained a little about "The Icon" and the history of Chivas Regal, before a hidden door opened to reveal the "Heritage Room". 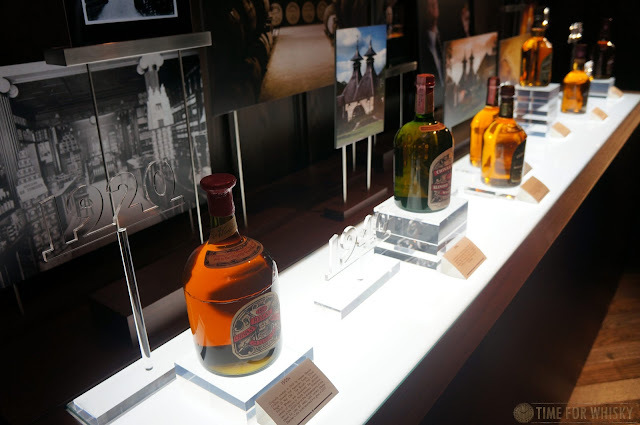 The "Heritage Room" (a library-like room filled with books, whisky and vintage cocktail equipment) contained a brief history of Chivas Regal, including bottles from the 20s, 40s, 70s, 2000s and today - the full history of Chivas Regal. 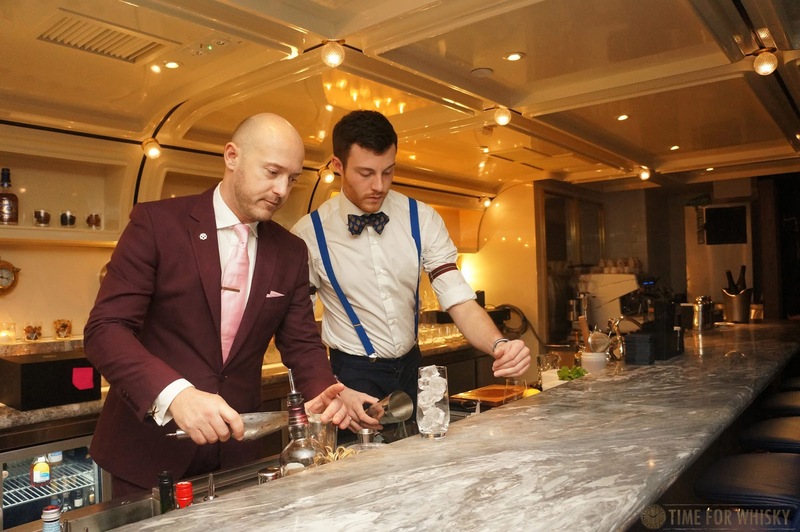 We clearly must have looked thirsty, because before we knew it, we were offered our choice of welcome cocktail. Opting for the Chivas and Aperol-based choice, we found it the perfect antidote to the uncharacteristically humid winter's day outside. After finishing our cocktail (and enjoying a brief chat with Colin), we were taken to the bar, shown our seats, and presented with a choice of three ingredients - cranberry, ginger or passionfruit. 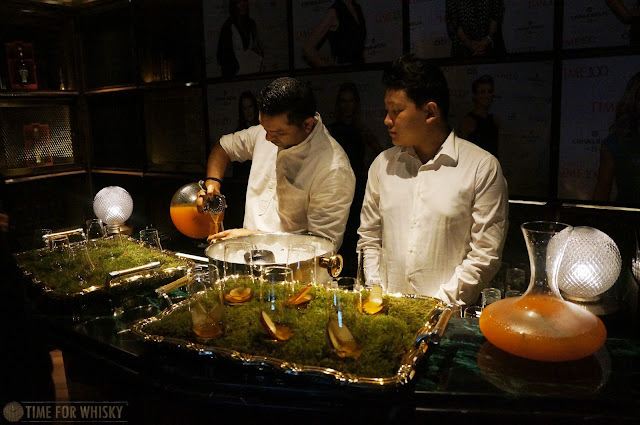 Opting for cranberry (with good friend of TimeforWhisky Eddie opting for passionfruit), we then watched as Chivas Regal's global brand ambassador Max Warner whipped up two stunning drinks, and served them alongside two large mystery boxes. 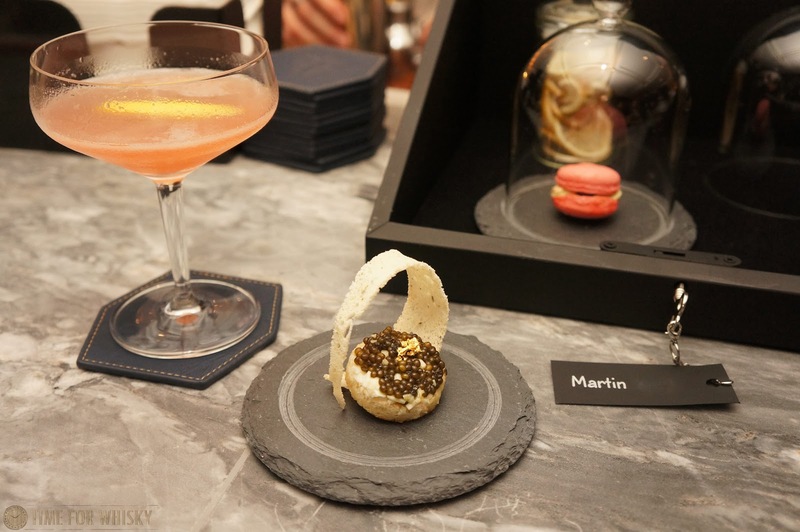 This was where the keys came into play - opening our boxes revealed two sensory items (for nosing), and two canapés - one sweet and one savoury. Certainly an interesting (and elaborate) take on the welcome cocktails and canapés! After finishing our cocktails, it was off to yet another room (by this point we're starting to get a taste of Foxglove's huge-by-Hong Kong-standards 4,300sq ft) - the "Icon Room". 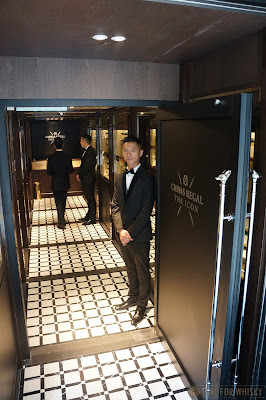 As the name might suggest, the "Icon Room" was where we got to see the Icon up close and personal, and watch a brief video explaining the background and philosophy, which Colin later elaborated on. A lot of ultra premium whiskies carry incredibly intricate and detailed bottles and packaging, and "The Icon" was no different - with a handblown crystal decanter (by the UK's Dartington Crystal), and an impressively detailed leather case. Of course it's all about the liquid inside, and Colin explained more about that over lunch. After our tour, it was time to visit the dining room and take our seats for lunch. 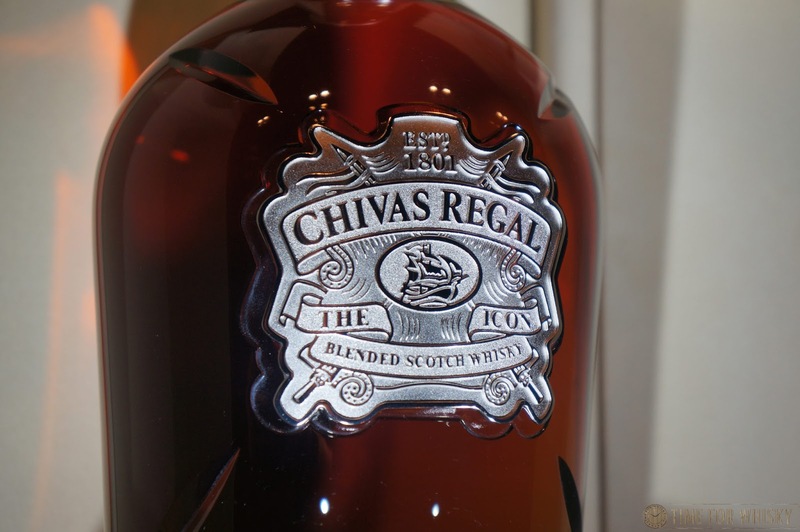 At each of the forty places was a trio of Chivas Regals (Brothers' Blend, Extra and Chivas Regal 18), and our menu. Rather than a traditional pairing menu, guests were invited to sample each whisky with each course and choose what worked for them (a trend we're seeing more and more these days - and one we enjoy). Pernod Ricard Sales & Marketing Manager Murray Lang welcomed guests, before handing over to Colin, who talked us through a brief history of Chivas Regal - starting with the Chivas Regal 25 (which was introduced in 1909, disappeared during prohibition and didn't re-emerge until Colin brought it back in 2007), and introducing The Icon - likening it to Hong Kong ("an iconic city"), and explaining the increasing thirst for ultra-premium blends in Hong Kong and the broader Asia Pacific. 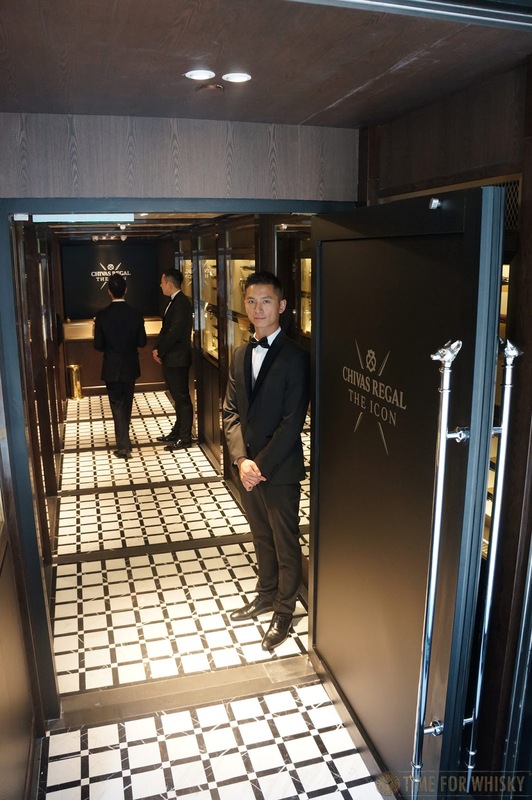 We learn from Colin that "The Icon" is not a "Limited Edition", but a "Limited Release", with only 1500 bottles released in 2015 (10 destined for HK), and 1800 to be released in 2016. 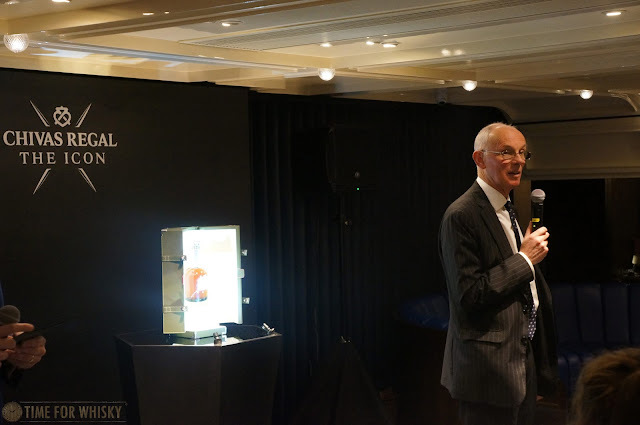 Colin explained that the philosophy behind "The Icon" was to include "nuggets of lost distilleries" - little flavour nuggets from distillers no longer in operation - whilst staying true to the Chivas Regal style. 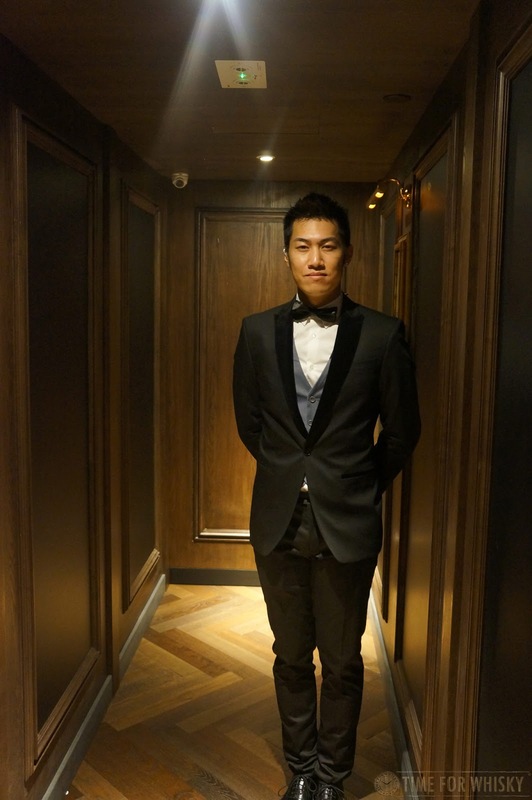 Whilst those nuggets will differ from year to year, the overall style and profile will stay the same. We'd love to know a little more about the composition of the whisky (i.e. 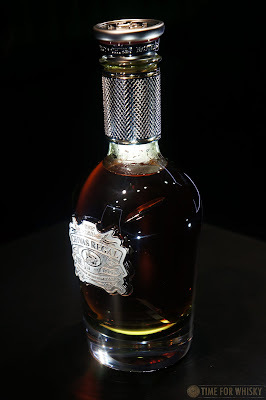 the oldest whisky, the youngest whisky, which closed distilleries were included etc...) but the focus with The Icon seems to be on the flavour as a whole, rather than the individual whiskies that make up the blend (fair enough). We did get a little more insight later in our blending session. Lunch consisted of two courses followed by a tray of stunning petit fours. 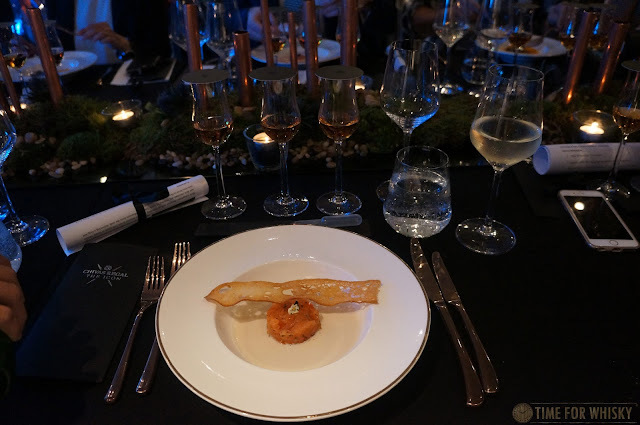 We found the first course (Loch Fyne Smoked Salmon Tartare, Crisp Toast and Cauliflower Cream) paired best with the Brothers' Blend - the smooth confectionary notes of the whisky blending well with the salmon's saltiness and the cream's tartness. 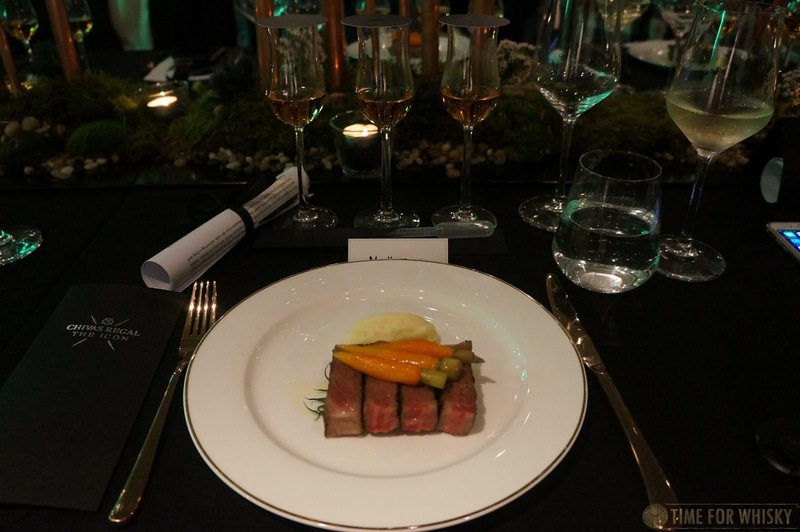 The second course (Seared Wagyu sirloin, glazed baby carrots on potato quenelle and sautéed French beans) matched the heavily-sherried Extra brilliantly (though also paired well with the 18). After finishing our courses, the lights dimmed and the distinct sound of a sole violin could be heard, getting louder. The curtains opened and a violinist entered, followed by waiters carrying trays of domes, under each, a Riedel Vinum whisky glass glass. Hmm, what was this? 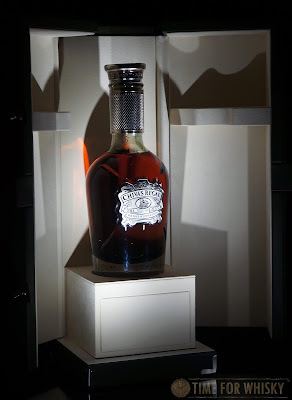 Colin then got up to introduce it as the Chivas Regal 25 year old, and explained that whilst there are no records of the original composition from 1909, it was known to contain Strathisla at its heart, just as the current release does today. Nose: Peaches and fresh summer fruit salad (I have to say though - I'm not a big fan of the Riedel Vinum whisky glass for nosing). Palate: Huge (considering we're only talking 40% ABV) but very smooth. Almonds, marzipan. Cadbury dairy milk, caramel. Hazelnuts! Definitely a dessert whisky. Finish: Long with a smooth milk chocolate (not dark chocolate) hint. After several hours enjoying brilliant cocktails, food, whiskies and company, it was time for a few of us to join Colin in the "Icon Room" for an intimate blending session and, most importantly, a tasting of "The Icon" itself - but we'll save that for another post in a few days. 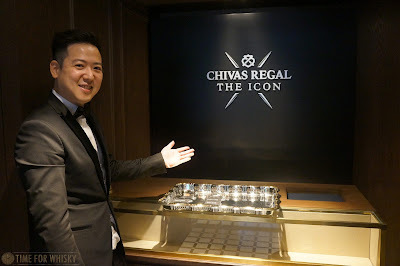 TimeforWhisky would like to say a tremendous thanks to Pernod Ricard Hong Kong and Stir PR Hong Kong for the invitations to all the wonderful events at the "House of Chivas". Great and detailed post! Amazing! We haven't even had time to send out the post-event release yet, and you hit every base. Thank you so much for joining us! Thanks for having us Robin! Love your work! Hendy - definitely have to check out J&M when I'm back in Sydney!